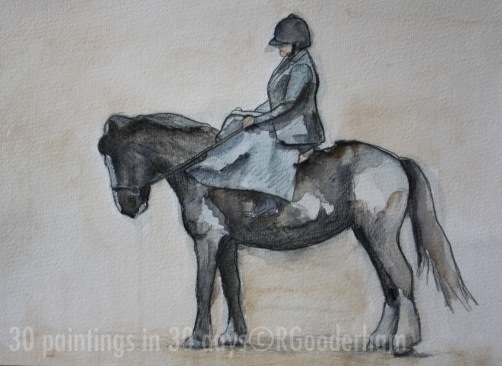 I have called this painting ‘Patience’….. My reference image showed a handler chatting on his mobile as his pony waited patiently by his side. I have changed the colours, lighting and composition as well as losing a complex and distracting background of spectators at The Great Yorkshire Show. 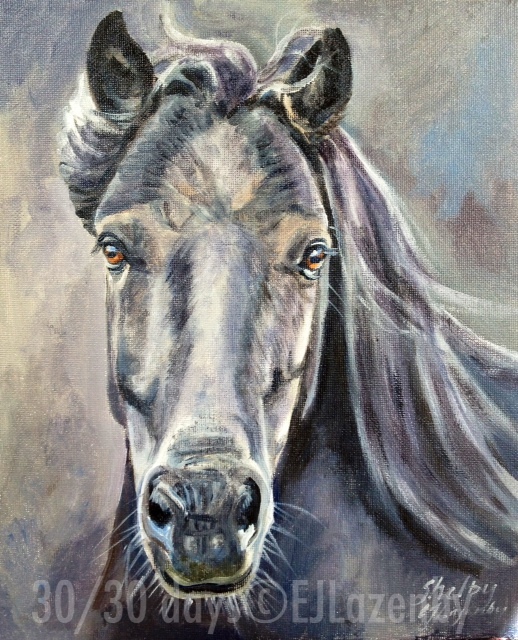 My intention was to create an expectant look in the pony’s eye, an extra glossy coat, limited colour palette and a quiet atmosphere very removed from my original reference… The other reason I have given this painting this title was that I usually work more quickly and fluently on a piece, and I had to rein-back my urge to paint onwards, and exert a little ‘patience’ of my own so that none of my students felt the pressures of time or were left behind…. 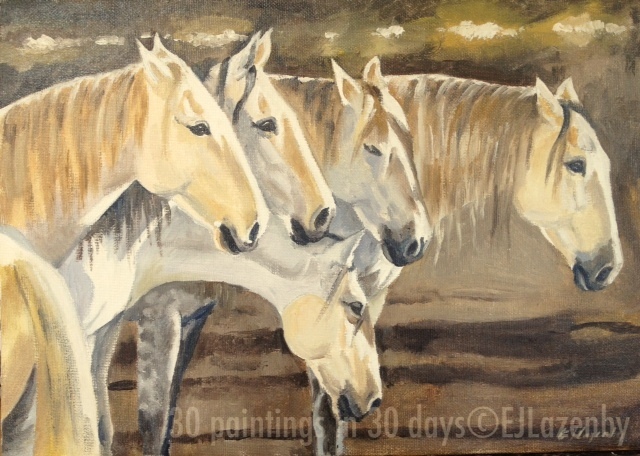 Maybe I should call this piece ‘Patience Doubled’? 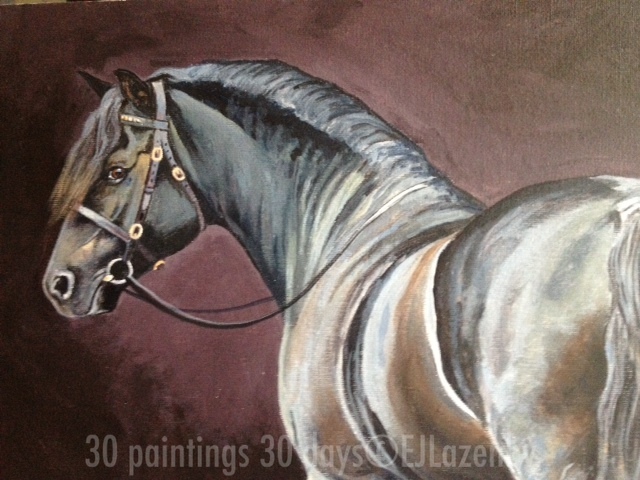 Todays painting is all about experimenting and looking at light. 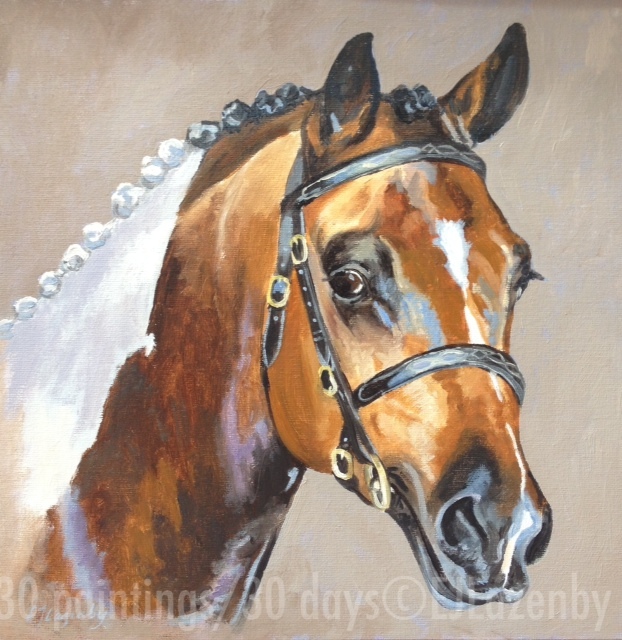 I took this photo when I went on a weeks painting workshop with the Society of Equestrian Artists this year. 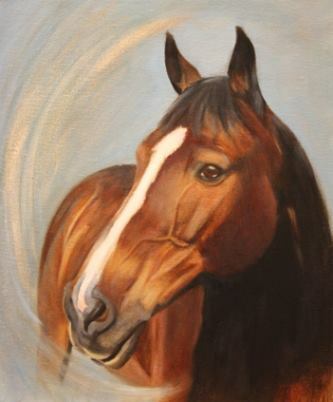 This horse was one of our models and I spent a lot of time with them in the evenings taking lots of photos. I love the way the evening sun shines through his tail like liquid gold. I’ve never really portrayed light like this in a painting before and I have to agree with Jane that painting light is so satisfying. I still have a long way to go but think I’m slowly getting there in achieving the effect. In this painting I’m also beginning to look at combining the figurative with abstract. The houses in the hills in the background have been simplified and are represented by creating abstract block shapes. 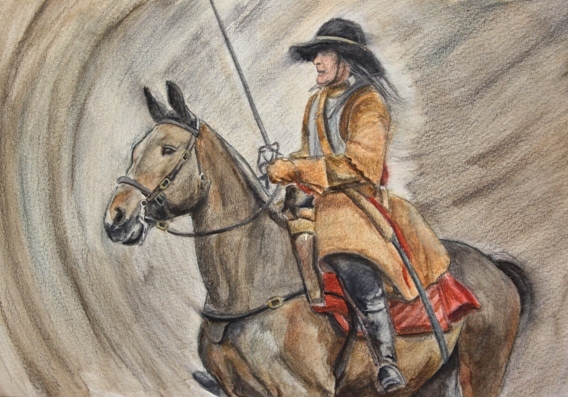 I’m also starting to look at different effects I can create using the oils which can be seen on the left hand side. I have used this effect a few times during the challenge and I believe it gives a dream like quality to my work which I’m really enjoying using. I think I could take this further. 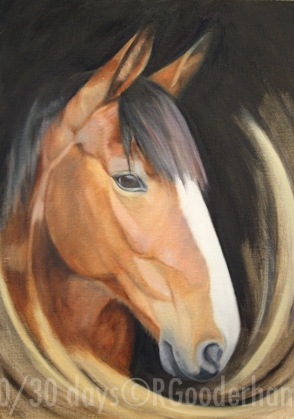 The way I have portrayed the horse is also a lot softer than some of my other pieces and as a whole I think it all works well. This photo was donated to Janey and I via our Facebook page. I recognised him straight away! He has the most unique eye I have ever seen. 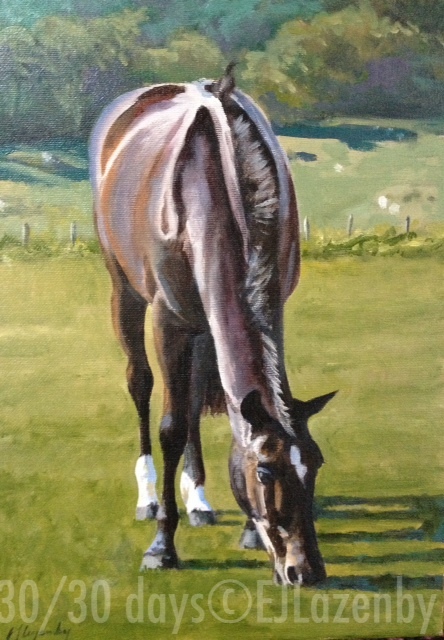 I had previously been commissioned to do a pencil drawing of Rikki by his owner so I jumped at the chance to try and portray him in oils, just to see if I could do it. I am so pleased with the outcome. I particularly enjoyed creating the light on his coat which helps highlight all the veins on his face. I also decided to make the background slightly more different rather than just blocking it in with one colour. It’s all about colour and light… These horses are taking a brief break from performing in the main indoor arena at Equicirque’s ‘Adrenaline’….. Lorenzo was working another group of his horses and this small group amazed me – all fire and spirit when performing, yet they instantly switched off and looked like a group of old donkey’s the second Lorenzo turned his back. They also has a strict pecking order between them and there was lots of grimacing and flicking of ears till they had sorted themselves into their working order…. Both blue and golden yellow spotlights were used in the performance, giving their pure white coats a beautiful and surreal colour which I have further enhanced. Originally there was another horse in the composition, but I removed him and felt the resulting image was more balanced…. I would recommend Equicirque to any of you horse loving speed freaks – it was very entertaining! 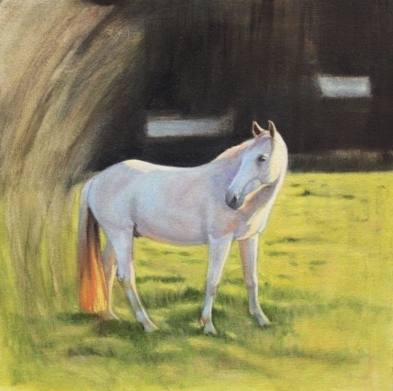 ‘Mes Amis’ became the title after some thought about Lorenzo’s origins and those of the horses, plus after observing the horses and a herd, I could see the close bond they had, both with each other and with their masterful owner, Lorenzo….. I knew before I began this challenge that there would be days when I couldn’t physically get to my studio and produce an oil painting. Today is one of those days! Unfortunately the day job has had to take priority and I have had to go on a training day so in turn have lost a full day painting.